God has placed us in our homes, in our workplace, in our schools, in our community to grow and to contribute to the growth of others. ABCers are teachers, nurses, business owners, seniors in assisted living, stay at home parents, police officers, attorneys, city workers, realtors, cleaners, students, artists, volunteers, community activists… Each of us has our own sphere of influence in which to shine. Our activity in daily life is part of our spiritual worship. God has also brought us together as a church body to accomplish together what we cannot do alone. We believe we honor God when we work together in his name. Here you will find some of the ways we have united our efforts to bring God’s love to our larger community. So grow where you are planted! And check out some of these other avenues of service. Maybe one is just right for you. You will discover the great joy of giving of yourself to others. A Friendship Gathering of People of Different Faiths. Four Thursday nights, 6:30 PM. Meatless potluck** meal, followed by sharing of that congregation’s outreach/ministry experience. Meatless potluck is out of respect for religious and dietary observances. Call the church for more information (626-797-8970). A lighthearted evening featuring creative expression of hope and progress: music, poetry, dancing, clapping. To lead or share an act in this session, please contact Lori Stein, 626-833-1492. ACTS including representatives from local Baha’i, Baptist, Christian Science, Episcopal, Jewish, Islamic, Lutheran, and United Church of Christ Communities. **Please bring vegetarian dish to share: appetizers, main, dishes, fruits, salads, desserts, etc. **Please bring a vegetarian dish to share: appetizers, main, dishes, fruits, salads, desserts, etc. Rabbi Joshua Levine Grater, Executive Director of Friends In Deed and former leader of Pasadena Jewish Temple and Center, will be the keynote speaker at Altadena Baptist Church’s thirty-fifth annual Black History Celebration, on Sunday, February 18. The program, which will begin at 5 pm, will also include several musical genres to emphasize the theme, “Finding Harmony in a World of Dissonance.” Afterwards, all those attending will be invited to enjoy a free soul-food fellowship meal. Rabbi Levine Grater has been an activist on behalf of various social causes, locally, nationally, and internationally His writings have been published in The Huffington Post, The Jewish Journal of Southern California and The Times of Israel. In his current position with Friends In Deed, he is responsible for running the Pasadena Bad Weather Shelter, which provides a hot meal and safe sleeping space for homeless people when weather conditions are poor. His agency also sponsors the Women’s Room, a place where women with limited resources can find a helping hand, as well as supportive friendship. When not working, Joshua rides his motorcycle, hikes in the hills around his home, plays percussion, teaches Jewish meditation, and enjoys playing and watching sports. He loves live music and being with his family. He lives in Pasadena, CA with his wife, Franci, twin teenagers, Noah and Ella, and his dog Luna. Do you need some change in your life? Do you feel the need to grow in a healthy direction? Have you ever wondered what God is up to in your life? Maybe All Church Picnic/Retreat is right for you. We will escape the routines of our lives for a time to be together, to look inward and to look upward. God will be there, and we would love for you to come meet God with us. Join us for an afternoon of outdoor recreation and a picnic. ABC will provide the hamburgers, hot dogs, and condiments. Please bring a picnic side-dish, drinks, or desserts to share. Also bring lawn chiars, picnic blankets, and outdoor games. Wear Outdoor shoes. Overnight Camping Available from Friday night to Sunday morning. (For those who are interested in overnight camping, please contact Claudia Rempel. Alpha is for thoughtful people with questions on a journey of discovery. No question is too simple, too difficult, or off limits. Conversation around a meal, listening to a talk, and small group discussion provide a place where friendships grow. Everyone is welcome! Alpha is for those who have questions about God’s existence, those looking for purpose and meaning in life, or those looking for a new connection with their faith. No one is required to say anything, and there is no homework. The next series will be on the calendar. 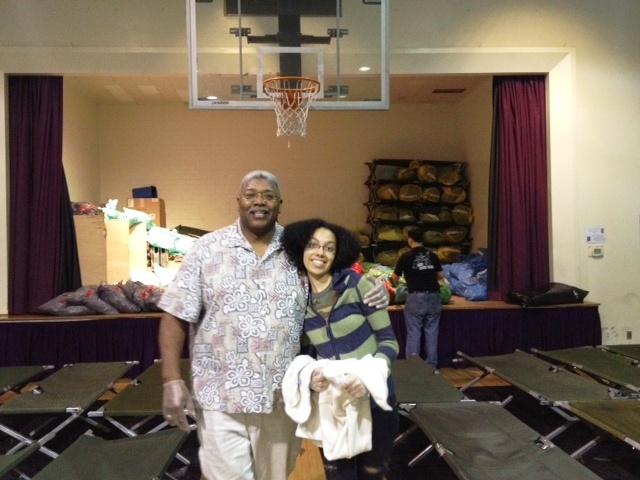 Altadena Baptist Church has helped staff Pasadena’s Bad Weather Shelter since it opened to volunteers in 1987. During the winter season a team of 10-15 volunteers is on duty every other week to prepare a hot, nourishing meal, set up the sleeping area, and help guests find their blankets and get comfortable for the evening. 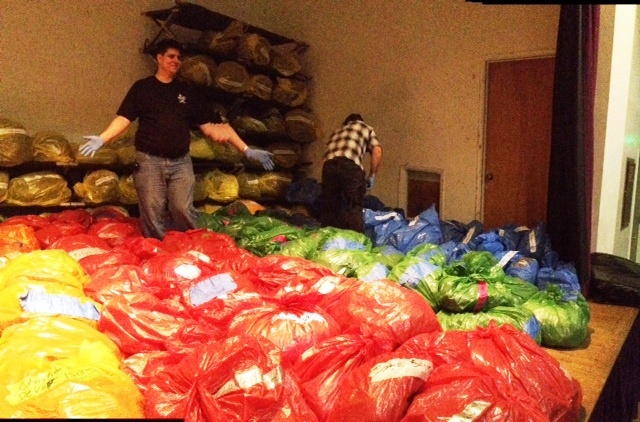 On a cold, wintery night our hearts are warmed by reaching out in love to the homeless in our community. Generous ABCers donated 17 turkeys, which became the basis for our hot, nourishing meals. 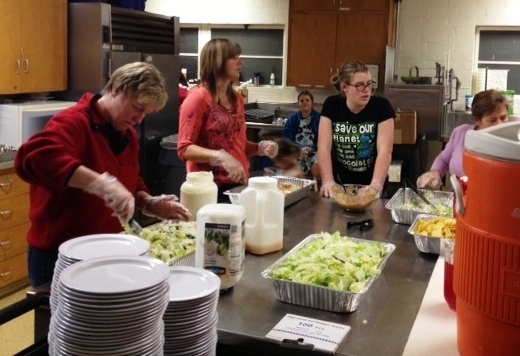 Some volunteers cooked the turkeys in advance, preparing them for use in the hearty main course. Other volunteers shopped for the ingredients to our meals. This behind the scenes preparation for our service was invaluable. Our coordinator of volunteers, Paula McCall, does the work of making sure we are well staffed every night. 12-15 volunteers were on hand each of five nights the shelter was open on our rotation. 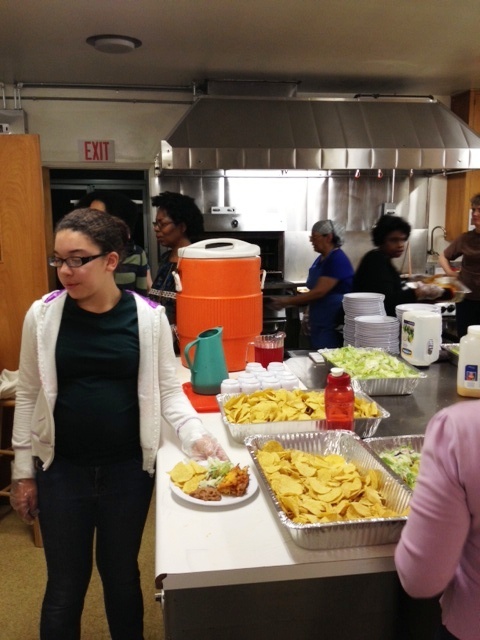 These cheerful workers cooked, served and cleaned up after meals, set up cots, distributed blankets, registered guests. In addition to our own ABCers, we were greatly helped by friends who came beside us, and by Elvira, our partner from St. Elizabeth Catholic Church, who was also our head cook. ABC provided the ingredients for the main course, and Elvira provided the other half of the meal. Robert DeVaughn sang for the guests once they had eaten and were settled for the evening. His voice, singing “Amazing Grace,” joined by everyone who knew the song, filled the gym with beauty. We are one of the few groups that brings children with us to volunteer. We especially appreciate teaching our youngsters compassion and service as part of their faith in action. Lori Ottaviano spearheaded a crew of volunteers to put on two weddings within two weeks of each other. These two couples needed to be married to be considered for shelter in the Door of Hope. Two beautiful, but simple ceremonies and receptions were held at ABC, given as a gift of love so these families could have a solid foundation as they build their lives back up. In cooperation with ACTS (Altadena Congregations Together Serving) ABC staffs the Altadena Community Food Bank the 4th Saturday of each month (10:00 AM to Noon). We are responsible for providing the following personal hygiene items each month: bathroom tissue, bath soap, deodorant, toothpaste, toothbrushes, feminine items. Please bring your donated items to the church office by the Wednesday before. 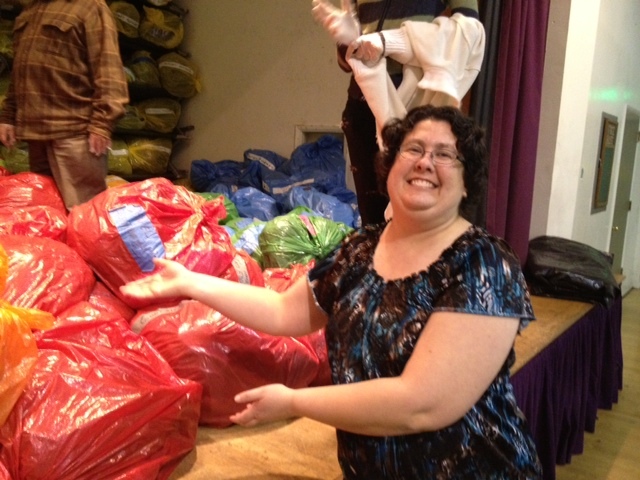 Thank you for helping with this community ministry. Also needed are plastic shopping bags. If you are able to help with this request, please bring your bags to the ABC church office. Thank you! The Women’s Prayer Brunch meets 4-6 times a year at different homes. See the Church Calendar for more specifics. Mix milk and eggs. Cook green onions and bacon. Drain and hold. In 13 x 9 inch pan layer bread, then cheese, then onion and bacon; repeat. Cover top with milk and egg mixture. Sprinkle with grated cheese. Refrigerate over night. Bake at 325 degrees for 40 minutes. Turn up to 425 degrees for another 15 minutes or until done. Feel free to add your own unique touches. At one of the Prayer Brunches, there was a new casserole that was a hit. Baked French Toast Casserole with Maple Syrup is copyrighted, so here’s the link to the recipe at the Food Network.